"I want you to be a good pastor." So, while still very young, Jonah was left a complete orphan. He spent many days and nights at the cemetery at his parents' graves, picking flowers and weaving wreaths for them. He had no refuge except the cemetery, but the cruel watchman beat him and drove him out even from there. The child began to wander on the streets and on the sea shore, feeding on the contents of dustbins and sleeping at night on garbage-dumps outside the city. He found a refuge for himself in one of the Odessa bell-towers, but was driven out of there by cruel people. Finally his uncle had pity on him, and then his former nanny. They gave him shelter and sent him to school. But he never ceased to feel that he was an orphan. He studied in a church school, where his teachers noticed his good qualities. Having a good voice, he took part in a church choir. Once the exhausted boy fell asleep with a burning candle in his hand. He woke up to find his jacket on fire. He was taken to hospital suffering from burns. His mother appeared to him in dreams and protected him. Once she forbade him to go on a boat leaving Odessa. The boat sank on the very day the boy was planning to leave on it. The boy grew up to be God-fearing and religious, praying without ceasing to God. "Take Fr. Jonah's blessing... I felt a special grace in him, his soul is burning with a sacred flame. He will be a distinguished priest." He was appointed to serve in the village of Kardashovka, whose populace consisted mainly of Stundists. His labours of prayer bore fruit: two hundred of the Stundists, including their leader, were united to the Orthodox Church. When he had to leave them, after eight years' service, they wept bitterly. 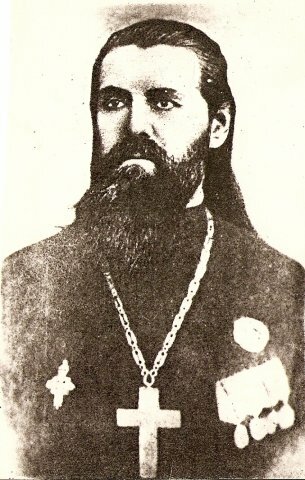 In 1897 he began his service in the Odessa Dormition cathedral. He was greatly loved by his flock, all of whom tried to be present at the early Liturgy, which he usually celebrated. They hung on his every word. His house was open for all those in sorrow or homeless, and no one left him unconsoled. He knew people well, could read their thoughts and penetrate into their souls. He could find good in people which no one else saw. He was especially compassionate to orphans, sheltering, feeding and clothing many. He was kind and attentive to all. He constantly served in church, and preached sermons after every service. At home he prayed without ceasing, getting up at midnight to pray for everyone. During storms he would always be in church, praying for those at sea. At night he would serve the midnight service and read akathists, and noone who was present at those night services will ever forget them. In 1901 Fr. Jonah became pastor of the maritime port church of St. Nicholas. Thousands of people were cured of physical and spiritual infirmities through his prayers. He built a hostel at his church where many vagrants, travellers and demon-possessed people whom he had cured found refuge. Through confession, Communion, prayer and conversation he brought them to life again, and they became respectable and orderly people. "Why have you travelled to see me? You have your own John of Kronstadt in Fr. Jonah!" Between these two luminaries there grew up a mutual love and friendship, and Fr. John, as a token of his love, sent him a marvellous set of white vestments trimmed in cornflower blue, and with cuffs of the same colour. Fr. Jonah was so fond of these vestments that he asked to be buried in them. Being an artist in soul, Fr. Jonah's services were noted for their inspiration and external beauty; complete silence reigned in them. He read the Gospel in such a way that every word penetrated deeply into the soul. He loved to sing and himself composed music for many spiritual hymns and stichera. The entire service to the Dormition of the Mother of God was sung in his church to compunctionate chants which he wrote himself. On Sundays and great feasts, after the Liturgy, Fr. Jonah went to the hostel for a dinner prepared for pilgrims, the poor and the destitute. A choir of singers gathered round him at table and, when the meal was ended, would sing religious cantatas set to music by Fr. Jonah. There were so many prosphoras at the proskomedia that they had to be brought to him on large trays. He would celebrate the proskomedia aloud. During the Liturgy the demon-possessed would utter terrible, blasphemous shrieks and cries. Fr. Jonah would communicate them frequently. They would have to be carried to the chalice, but would return quiet and normal. Fr. Jonah also blessed holy water every Sunday and even on weekdays. When he sprinkled it on raging demoniacs, they would immediately calm down. "I am grateful to God that I do not find the lack of faith and indifference to religion which it is so sad to hear about in recent times in the complaints of pastors of the Church. Here both rich and poor, educated and simple people - everyone always prays with deep faith, with a feeling of piety and great attentiveness, and listen to my sermons." Batiushka's spiritual children, with his blessing, also kept the Fast strictly in the following manner: on Mondays and Tuesdays they ate nothing; on Wednesdays they received Communion and ate the antidoron which Batiushka distributed at the conclusion of the Liturgy; on Thursday they ate nothing; on Fridays they received Communion and ate some food cooked without oil; on Sundays they again received Communion and ate some food cooked with oil. And thus they passed the entire Fast. One of his spiritual daughters who had kept the Fast in such a manner related that by the time the Fast had come to an end she had ceased to feel the weight of her body, such was her lightness and spiritual joy, through the prayers of Fr. Jonah. At the end of the Liturgy, Batiushka distributed the antidoron as Psalm 33 was sung with compunction. Fr. Jonah made it a standing rule in his parish that this psalm be sung and not merely read. "O Lord, send me victory!" The Lord answered: "You are a pagan." "But I glorify Thy name!" said the emperor. The Japanese were victorious. Indeed, in the Russo-Japanese war, it seemed as though even the elements aided the Japanese; the wind blew in the same direction as their shells, etc. Very early in his life the grace of the Holy Spirit began to act and manifest Himself in Fr. Jonah. While yet a deacon he had begun to work miracles. Vera, his oldest daughter, died while still an infant. Fr. Jonah took the dead child in his arms, fell to his knees before the icon of the Mother of God and began to pray. Little by little the baby returned to life and recovered. She was his favourite daughter and outlived him. In Odessa there lived a famous doctor, Professor V.P. Filatov. Once a peasant woman brought him her two-year-old son, who had been blind from birth. But the Professor after examining him said that he could do nothing for him; science was powerless in such cases. The sorrowful mother then took the child to Fr. Jonah. For nine nights Fr. Jonah stood praying for the child, ceaselessly serving molebens and akathists. On the tenth day he returned the child to his mother, completely cured. People began to talk about the miracle, and the Soviet authorities decided to conduct an investigation. They called Professor Filatov and tried to get him to accuse Fr. Jonah of deceit and blackmail. But the professor insisted that this was the child he had examined, and that a miracle had taken place. "How can you admit a miracle here?" they asked him mockingly. But he stood his ground, and the trial ended inconclusively; noone was punished but religious faith was strengthened in the city. A certain peasant had a twelve-year-old son who was born blind. Hearing that Fr. Jonah was healing the blind, he brought his son to him. Fr. Jonah sent the parents and their son to Dr. Filatov. "Only a miracle can help him," was the physician's diagnosis. They then returned to Fr. Jonah, who ordered that they leave the boy with him (this took place during the Great Fast), and began to pray for him and give him Communion. Within two weeks the child began to see. "Through the help of Fr. Jonah's prayers." "What have you come to see: what Fr. Jonah will do to us; how he will drive us out?" "I am fearsome," replied the demon. "A righteous man is not afraid of you; and a sinner cannot see you. Leave, I tell you!" "I am fearsome! ", the demon repeated. "A righteous man is not afraid of you; and sinner cannot see you! ", Fr. Jonah repeated. This happened three times. After the third time the demon departed. Because of the expulsion of his demons, the enemy of mankind took cruel revenge upon the family of Fr. Jonah. He had but to begin to cast out a demon and a fire would break out in his house without any apparent cause, or the cats would go mad. Thus the beleaguered family was not at all pleased when the possessed were brought to Fr. Jonah for healing, for they knew that there would again be misfortunes. And turning to the Jewess he asked: "What do you need?" The child continued to live and by 1948 had attained full womanhood. "Do not bow before me, but before the people whom you have led astray!" And the penitent priests went out onto the ambon, knelt down and prostrated themselves before the people, begging their forgiveness. Fr. Jonah then reunited them to the Orthodox Church. The renovationists caused Batiushka much grief, even wishing to have him deported. But the Lord preserved him, for he was His chosen one. "Praise ye the name of the Lord! Praise ye the name of the Lord!... Alleluia! Alleluia!" "Weep not. They will repent!" Fr. Jonah endured much persecution and many misfortunes, not only at the hands of invisible foes, but of visible enemies as well. One day, a crowd of seamen, unbelievers, fell upon him; they threw him down and began to choke him, damaging his vocal chords to such an extent that for the last few years of his life he spoke so softly that the sexton had to stand at the doors of the altar during the Divine services amd repeat Batiushka's exclamations so that they would be audible to the faithful. "I will entreat God that He grant you a painful death to cover up your sins and further your salvation!" Later, she went insane and was committed to an asylum. When the Germans invaded, they gunned her down with others that suffered from psychological disorders. He was also grieved by one of his spiritual daughters, the nun M. She was one of his favourite daughters. A talented artist, she became the tool of the devil; she became fascinated by a young monk, fell into sin with him and left for New Athos. On the way, she disembarked from the steamship and poured forth the poison of calumny upon Fr. Jonah, reviling his good name. The enemy also wreaked vengeance upon Fr. Jonah through his own children: they were almost all sorry failures: they were expelled from school, misfortune haunted them; their marriages were unhappy. All of this was the devil's revenge. The demon replied: "Do you always pray to the Mother of God? Ooh! Anyone but her!... Well, I'll get back at you through your children!" "Remember, O Lord, all those on earth and those beneath it!" The demons screamed out in the church: "Don't pray for us, old man!" "The sun shines equally on all me; and the mercy and grace of the Lord is for all men equally. Pray together in a general moleben. Everyone kneel!" "Go out and tell the woman with the baby to kneel down!" Trembling seized her when she was struck by the realization of his clairvoyance. The child recovered. The most extraordinary things happened to Fr. Jonah. Often, on leaving his bedroom in the presence of his family, he would vanish and at that very moment appear at a village outside the city where some possessed people whom he had cured lived. Or he would leave his home on foot but show up suddenly in his bedroom, even though the doors were shut. "Go to such-and-such an inn; there you will find your horses; take them away with you." The animals were indeed found where Batiushka had said they would be. "Well, you're all worn out from chasing after me, poor Natasha. Here's a prosphora for you!" "Wretched woman, you haven't prepared to receive Communion for fifteen years!" And he vanished... Astounded by his words and at a loss as to how he could have known about her, the woman began to run about the cemetery, searching for the priest; but she could find him nowhere. Tired, she returned home, but was unable to sleep, amazed was she by the pale priest with the gentle eyes and quiet voice. "It was John of Kronstadt!" The other maintained: "No! Fr. John was of medium stature; this priest was tall!" "Cursed ones! Have you flown off?!" "You are drunkards; you'll just waste it on drink!" "You are a struggler! Pray for the world!" - and fainted on the spot. Regaining consciousness, she related everything to Batiushka and presented him with a copy of the Kishinev newspaper. "Angels used to carry Fr. Jonah to various places. The demons saw this, waylaid him and carried him off to Kishinev. The angels then bore him home again." Fr. Jonah was renowned not only in his homeland, but abroad as well, receiving, as did Fr. John of Kronstadt, letters and telegrams requesting his prayers for the sick and suffering, as well as letters of gratitude from those who had received healing and aid. He especially believed in the power of the prayers of parents, and when he found himself in grievous and unpleasant circumstances, he used to go to pray at his parents' graves. Once, he beheld in a dream his own brother, enveloped in fire. On the morning of the following day he served the Liturgy for him. That night he again beheld his brother, but this time he was in fire up to his knees only. Again Fr. Jonah served the Liturgy, and the next time he beheld his brother he had been completely freed from the fire. During the first years of Soviet power, the authorities did not touch Fr. Jonah. Then they began to conduct searches in his house and summon him to interrogations. During the removal of church valuables they also took many things from him. Then they tried to arrest him, but the workers and peasants raised such a tumult that they had to let him go quickly. Fr. Jonah died after a long and painful illness on May 17/30, 1924. His funeral was extraordinary. Not only the inhabitants of Odessa - all the poor, the tramps, the stevedores and waterfront workers who knew and loved him - but people from outlying villages, towns and neighbouring cities came together to bury their intercessor and benefactor. The authorities forbade them to bury him on Sunday, hoping to avoid a huge assemblage of people; but on Monday even more people came. All of the vast escalier of Odessa, at the base of which stood the church of St. Nicholas and the house in which Batiushka lived, as well as the waterfront were packed so densely with people that the coffin of Fr. Jonah, borne aloft by those who honoured him, moved with extreme slowness. Workmen had requested that the burial itself be postponed until after four o'clock in the afternoon when they finished work for the day. They began to carry the coffin to the cemetery at four o'clock, reaching it only in the dead of night, the interment taking place at midnight, so slowly and solemnly did they carry the much-suffering body of Fr. Jonah, stopping frequently to serve litias. "They will raze the church; it will no longer exist." "so that the birds may sing over me... Do not build a church; bury me near my relatives." His grave became a place of prayerful assembly for the believers. A lampada always burned in front of the icon, and the venerators of Fr. Jonah came to his grave on his namesday and on feastdays, seeking his intercession and kissing his portrait. Fr. Jonah used to receive visitors in his bedroom seated in that chair, and there it was that he had spent the last days of his earthly life. After Batiushka's death, one of his spiritual daughters received a whole box of bread which Fr. Jonah used to distribute after the Liturgy. One day, she learned that one of her relatives had been involved in a horrible accident; petrol had exploded into flame and covered her body, turning it into a human torch. Terrified, she began to run about outside, screaming. By the time those who had run up in answer to her screams had managed to put out the fire, her legs, stomach and chest had become one huge blister. When Fr. Jonah's spiritual daughter found out about this calamity, she went to the hospital and gave her relative a piece of Batiushka's bread to eat. Her burns had been diagnosed as fatal, but through the intercessions of Fr. Jonah she survived and recovered. In 1947 a woman who was subject to convulsions went to his grave, wept there, prayed, fell down and foamed at the mouth. When the sick woman regained consciousness she felt healthy again and her seizures stopped. A Jewish woman, a dentist by profession, fell seriously ill. Her physicians recommended that she undergo an operation, for her condition was critical; but her neighbours, Christian believers, advised her to go to the grave of Fr. Jonah. This the poor woman managed to do, though with considerable difficulty. When she returned thence to her home, the spot which had been giving her so much pain began to ooze pus and her condition improved. Православия ревнителю, раскола и ереси искоренителю, / Одесский целебниче и к Богу теплый молитвенниче, / житием и чудесы твоими уподобился еси Кронштадтскому чудотворцу, / Ионо праведный, моли Христа Бога спастися душам нашим. Многоразличныя подвиги жития твоего кто исповесть? / Многообразныя милости Божия тобою явленныя кто исчислит? / Дерзновение же твое у Всещедраго Бога и Пречистыя Богородицы добре ведуще, / во умилении сердечнем зовем ти: / не лиши и нас твоея помощи и заступления, // пастырю Христов и чудотворче Ионо.